Broadcast here November 22nd 11 to noon Eastern. All my shows are available at my Patreon page – please subscribe and keep this program going! NOTE: THE VIDEO VERSION OF THIS INTERVIEW CAN BE VIEWED AT MY PATREON PAGE. Did newly-elected Austrian Chancellor Sebastian Kurz eject George Soros’s foundations from the country? And is Kurz a 9/11 truther who was “red pilled” by watching Loose Change? Those claims were made last month in a YourNewsWire.comstory headlined “Youngest World Leader Bans George Soros’s Foundations From Austria.” But the claims are false. It’s fake news. Does that mean we should trust PolitiFact, the site thatdebunked the story? Not really. PolitiFact recently “debunked” an obviously satirical story on Bowie Bergdahl wandering out of his court martial. 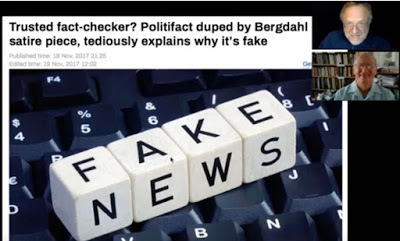 In a media world full of fake news peddling knaves like YourNewsWire and “debunker” fools like PolitiFact, how can we tell what’s real from what’s fake? Rule number one: Read carefully (don’t just skim) with your Common Sense Circuit on and your BS Detector operating. Rule number two: If it’s too good to be true, it probably isn’t. Examples: “MI6 Agent’s Deathbead Confession to Killing Princess Diana,” “CIA Agent’s Deathbed Confession to Killing JFK,” “Austrian Leader Is a Soros-Hating 9/11 Truther.” Rule number three: Avoid disinfo-peddling sites like YourNewsWire, and be wary of sites that target an audience of unsophisticated rubes, like Fox and Breitbart, and to some extent InfoWars. Rule number four: Find good sources, such as alternative journalists who are well-versed in their material, don’t talk down to their audience, and know how to do research…people like today’s guest, Peter Myers. Peter’s website, Mailstar.net, is a terrific resource for reality-based New World Order skeptics.